Is distilled green tea “healthy?” We haven’t consulted scientists, but for the sake of our “health issue,” we like the idea. Otherwise, the tomato juice in a Bloody Mary has lots of vitamin C, calcium and phosphorus, and the added lemon or lime squeeze brings more C plus protective phyto-chemicals like pectin. With America’s passionate embrace of green tea for its antioxidant properties, green tea soft drinks, cookies, chocolates, craft beers and foods of every description have flowed into the marketplace. It was only time before the liqueur appeared. 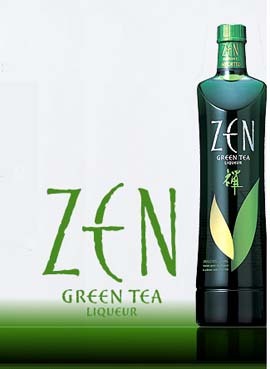 ZEN Green Tea Liqueur is the first super-premium green tea-based liqueur introduced in the United States. It’s a light, refreshing, modern-tasting green tea liqueur from Japan’s Suntory, one of the world’s leading spirits producers*. *In addition to Suntory Beer, the company owns Ballantine’s, Jack Daniel’s, The Macallan, Glenfiddich, Kahlùa, Campari, Bordeaux’s Château Beychevelle and numerous other beer, sake, wine and spirits brands. 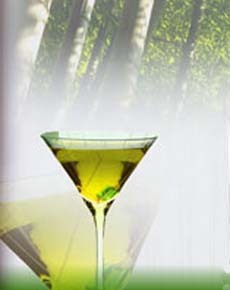 The liqueur uses green tea leaves from Kyoto, the historic capital city of Japan, well-known for its superior-quality tea. Leaves of the highest grade are grown by one of the most distinguished producers of fine teas in Japan, Marukyu-Koyama-En. A cultivator of tea for more than 300 years, this grower ensures that the very modern ZEN Green Tea Liqueur remains “steeped” in tradition. Developed specifically for the American palate, the liqueur combines tea, neutral spirits, herbs such as lemongrass and other natural flavors to achieve Zen...at 20% alcohol. What the taster will experience, if not true Zen, is a genuine green tea flavor, which is delightful on the rocks or straight up. For the cocktail crowd, Suntory offers the recipes below. 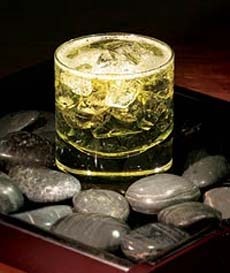 Creative mixologists will no doubt have more enlightenment in the offing. The 750ml bottle has a suggested retail price of $29.99. 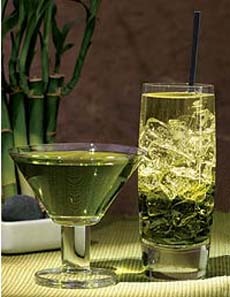 Mix 1 part of ZEN Green Tea Liqueur with 2 parts of dry sake. 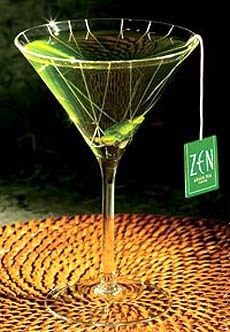 Mix 1 part of ZEN Green Tea Liqueur with 2 parts of white cranberry juice. Serve in an ice-filled tall glass. Zen Saketini (left) and Zen Breeze.